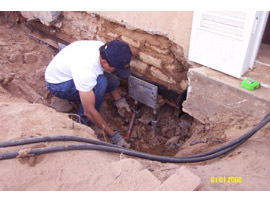 One of the most challenging aspects of conserving old earthen structures is arresting and reversing settlement problems caused by failed footings or collapsed soils. 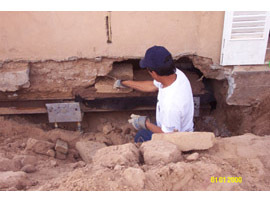 Crocker Ltd has developed several methods of underpinning massive adobe walls, even when they are built without footings. The following is one method that employs "adobe baskets." 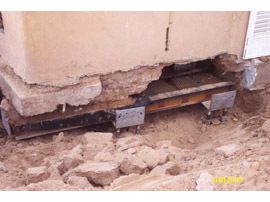 Interior view of a 150-year-old structure showing deflection of the threshold caused by collapsed soils. The wall is undermined in short sections. 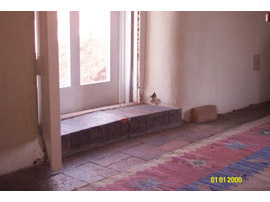 The concrete "contrapared" seen here was an earlier attempt at stabilization that only led to further wall deterioration. 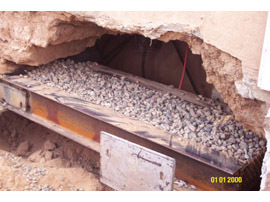 The baskets are custom fabricated to fit the sections of wall that can be safely undermined. They are supported on the A.B. 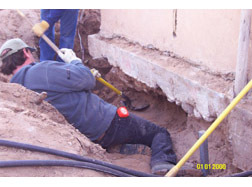 Chance® helical pier foundation system being installed here. 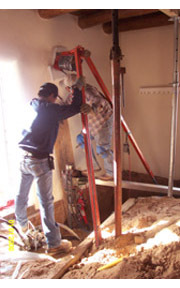 Installation of piers on the interior. The baskets are supported by the load transfer brackets. The baskets are designed to be structural as well as to break capillarity. This is accomplished by filling the basket with clean, rounded gravel and capping with a filter fabric. A mud bed is applied over the fabric. The damaged wall is rebuilt on the basket. 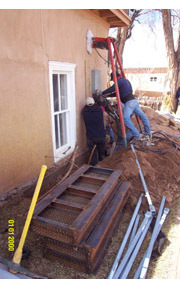 The basket is lifted into the damaged wall, providing structural support. 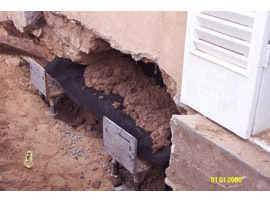 In some cases, no rebuilding is required and the mud is simply compressed into the wall base.